Sign up for our next FREE Embroidery Training. 2018 has been a very busy year here at The Embroidery Coach. I want to share what we have accomplished during 2018 and what the plans are for 2019. 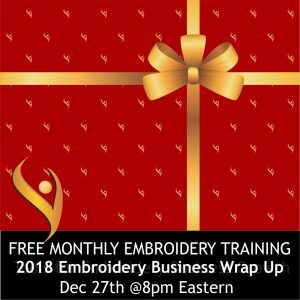 You want to be on the training so that you can learn about the new trainings coming up and what is happening here at The Embroidery Coach! This will also be the time when we have our year-end special of the Gold Level Plus Lifetime special! Many of you have been waiting for this to happen, it will be here from December 20th through December 31st! Have you had some big happenings this year? Let us know about it! I would like to talk about it and congratulate you on our training! I would love to share the milestones that you have reached this year! Remember, we are in this together! Make sure you plan to attend to hear all of the new happenings! signed up for the very valuable FREE training. The Embroidery Training Resource Center Members and the Inner Circle Members do not need to register! You will be sent a link to automatically attend! Make sure to mark your calendar!